1. Whisk egg and add the corn meal, flour with the baking powder and soda. 2. Mix well with all other ingredients one by one. 3. Add the veggies and mix well. 4. Pour the batter in the rectangular dish dusted with butter and flour. 5. Bake it in preheated 400 f temperature oven for at least 40 to 45 minutes or until it is baked. check with a knife or tooth pick inserted in the middle. If clean bread is perfect. 6. Cool in the wired rack and cut into cubes or desired shape you need. 7. Serve with hot soup. 1. All vegetables should be chopped into cubes. Have 2 cups of mixed veggies. 2. Heat oil in frying pan , add the grated garlic. 3. Add the veggies in this order one by one carrot, beans, onion. 5. Add the tomato paste and red bell pepper. Let it cook for some time now add salt, pepper and dried herbs. 6. Garnish with coriander and rosemary. Discard the rosemary while serving. 1. This is thin clear soup which is healthy with more vegetables. 2. If you need thick soup you can add cornstarch to this too. 3. You can use MW to cook the veggies too. Do not overcook the veggies it spoils the taste of the soup. It should be crunchy. Soup looks very summery & refreshing!Loved the color of corn bread. looks so nice... Yummy corn bread! you have completely made me crave corn bread! Corn bread looks so delicious! So is the soup! Great colour! wat a wholesome dinner..its dam tempting..
Wow..i too made corn bread today,not with pepper..sounds great with bell peppers..
Looks fantastic. Very nice combo. One more soup for me to try...great!! That soup looks gorgeous Pavi..! What a delicious bread - I've never had it with bell pepper in it. And it's the perfect match for this wonderful soup! oh that soup looks so comforting!! The soup looks appetizing.. good combo for a meal!! Wow super. This sounds interesting. I have never tried baking bread in my microwave. Should try it soon. Hey that looks so yummy!! Btw I also baked some bread today!! your bread looks awesome and so as soup ! I never baked a bread @ home as it requires yeast,I think now I can use your recipe next time to bake this.. Ideal soup for the weather here.The corn bread is a good accompaniment. What a yummy soup..i love to try that. Delicious bread and yummy soup. Looks healthy and delicious. 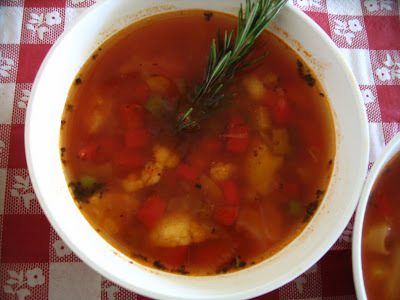 I love soup - this looks wonderful and so full of great flavors. The corn bread looks tasty too. corn bread yummy should give it a try !! You have wonderful pics in your blog. lovely presentation. 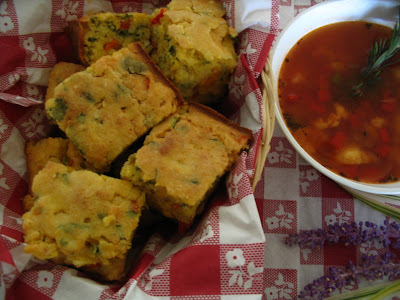 Corn bread tastes great along with soups right! Soup looks very comforting too. What a winning combo- Delicious bread and comforting soup. what a wonderful dinner! loved the combo...great recipes! 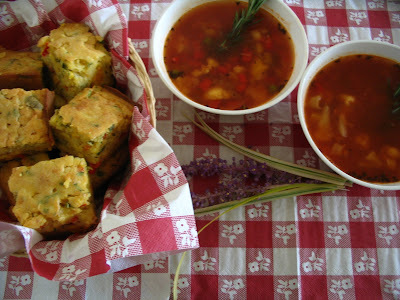 I luv corn bread.Yummy looking soup,perfect for summer:). I've had corn bread once and it taste very dry to me. Do u have any tips on how to make it moist?? Hi smitha..i dont know where you tasted the corn bread but the corn bread which i posted will be really moist. wow perfect dish for summer!!!!! the corn bread and soup looks so tempting Pavi ! wish i cud have a bite and a sip ! It is certainly interesting for me to read that blog. Thank author for it. I like such themes and everything that is connected to this matter. I definitely want to read more on that blog soon. It is very interesting for me to read the blog. Thanks for it. I like such themes and everything connected to this matter. I definitely want to read a bit more on that blog soon.